8th through 12th graders are invited to join RTSY, or Rodeph Torah Senior Youth. 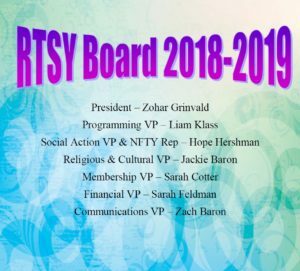 RTSY members form lifelong bonds through social events, community service, shul-ins (overnights at the temple), leading a Shabbat service each spring, planning and operating the annual TRT P u r i m Carnival, and activities with national Reform youth movement, NFTY (National Federation of Temple Youth). Want to ensure that you are kept up to date on all happenings with RTSY? Sign up to be a member! It is only $36 for TRT members and $54 for non-TRT members and you can sign up here. A new youth progams initiative has been put into place this year with membership. Youths MUST become a member of their youth group when they attend their second event of the year. Friday, April 5th – Saturday, April 6th from 5:30pm-8:00am. We will be having a catered dinner before TRT’s 6:30pm service. After services, we will be having amazing programs full of fun activities! Join us for this tropical evening! The event will end with a bagel breakfast! The cost of the event is $15 for RTSY paid members and $20 for non-paid RTSY members/NFTY teens. If this is your 2nd RTSY event, you must become a member. Spring Kallah is open to all 8th-12th graders! Throughout the weekend, we’ll celebrate our community as we welcome our 8th graders into high-school level NFTY and begin saying goodbye to our seniors. No matter how many events you’ve been to, Spring Kallah is sure to be a meaningful part of your NFTY journey! NFTY 678 Monmouth – More events announced soon! Scholarships may be available through the NFTY-GER Scholarship Fund. Should you need any assistance, please apply through NFTY-GER during EARLY BIRD registration for each event that you may need help with. Need-based subsidies may be available from the temple and the Jewish Federation. RTSY has this wonderful opportunity to be apart of NFTY-GER (North American Federation of Temple Youth -Garden Empire Region). There are a variety of NFTY-GER events throughout the year, as listed on the program calendar above. In order to attend them, you must be a paid-RTSY member. To sign up for NFTY-GER events, go to www.gardenempire.nfty.org Be sure to “LIKE” NFTY-Garden Empire Region on Facebook, Twitter, and Instagram to stay up to date on regional information and pictures! Chaverim (grades 2-4) has 3 events during the year and meets 12-2pm after Hebrew School on specific Sundays. Jr RTSY (grades 5-7) has events once a month from 6-8pm on specific Saturdays. MUST be in 9th grade to volunteer with this group. Dates are listed within the sign up form. This can count for Community Service hours!! Teens are responsible for the dates that they volunteer for. If they are unable to help at an event already selected, they need to reach out to the Shifra Malkin, Advisor. 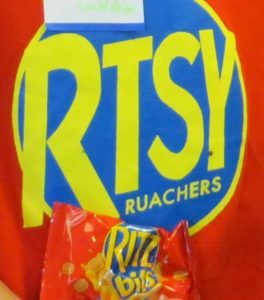 To volunteer at Jr RTSY, teens need to be in 9th-12th grade. Volunteers for Chaverim can be in 8-12th grade. Anyone who volunteers at any of these can earn Community Service hours. Looking for information about what other events we have scheduled for the year? Click the link for our Events flyer. It has all of the Chaverim (grades 2-4), Jr RTSY (grades 5-7), RTSY (Grades 8-12), and regional NFTY-GER (grades 9-12 with 8th grade being invited at the end of the year) events. Dates/events for are subject to change. Follow us on Twitter and Instagram too!! Text 81010 with the message – @srrtsy to join! If you have any questions, please feel free to contact RTSY advisor/Youth Director, Shifra Malkin at shifra.malkin@yahoo.com.